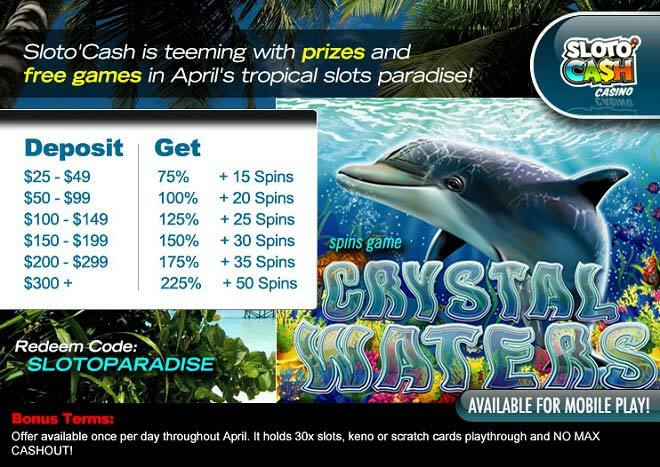 Plunge Into A Tropical Slots Paradise This April! Plunge into a brand new Sloto’Cash month and you’ll be discover an underwater world of wins with a 225% Match + 50 Free Spins that can be yours when you deposit as little as $25! Spin the Crystal Waters reels that are packed with winning chances and symbols such as tropical fish, sea turtles, gold fish and more will help you collect riches when you play with a 75% Match + 15 Spins and up to a 225% Bonus with 50 Free Spins! Wouldn’t you love to dive deep into a sea of Sloto’Cash wins this April?